Muesli is something I am constantly promising myself I will make. Why not! It is easy and healthy. Yet it is a long time since I made it. Then my sister was making it on her visit to my mum's and I had seen a chocolate muesli recipe. For the pedants, it was called granola but it has always been muesli to me, and I have a stubborn streak. I love that Kate of No Meat and Three Veg was giving this muesli to family as Christmas gifts. It is both practical and surprising. I loved that the muesli gave me a healthy opportunity to use up some of the fruit and nuts leftover from Christmas baking. Mine had a few more seeds than Kate's because I see it as an opportunity to use some of the seeds and grain in the pantry. And seeds are healthy. I really want to try chia seeds in muesli but worried they would go gluggy with the liquids. I also was fascinated by Joanne's use of dried quinoa in muesli. Must experiment! Chocolate is not something I normally enjoy at breakfast. I make an exception for this muesli. It is more intense than sweet. I have had it for breakfast regularly lately (except when I forgot to take it on holiday). I love eating it with vanilla yoghurt. The yoghurt picks up the cocoa and looks like a posh version of cocoa pops. Remember they used to say "just like a chocolate milkshake only crunchy". Well if I was to advertise this, I would say "just like a chocolate smoothie only crunchy"! When I can, I pair it with fruit. I have had apricots when in season, stewed plums and I think it would be great with slices of banana. It is also lovely as a snack with or without yoghurt. I am coming to the end of the batch of muesli and hope I motivate myself to make another batch. Meanwhile I am looking forward to breakfast tomorrow. I am sending this to Kimmy of Rock My Vegan Socks for Healthy Vegan Fridays #31. Five years ago: In search of . . . Mix all ingredients in a large bowl (leaving the dried fruit out if you don't want it really chewy). Tip into 2 large lined roasting dishes* and bake at 180 C for about 20 to 25 minutes, stirring halfway through. 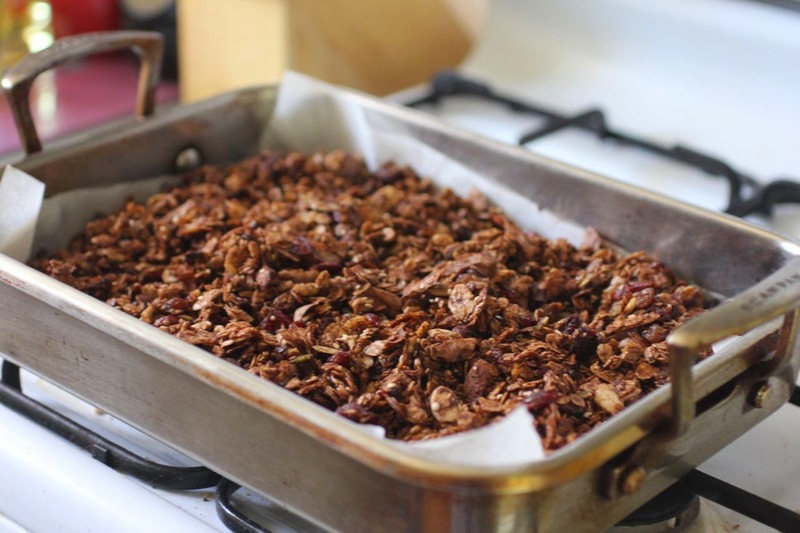 (If you left out the dried fruit, mix in when it is out of the oven.) Cool and store in an airtight container. NOTES: I found that using one roasting dish made my mixture too crowded to dry out. I ended up dividing it into 3 lots of baking each for an additional 5 minutes at the end but I think if I used 2 roasting dishes rather than one, it would work better. The muesli crisps up as it cools so it is a bit tricky to judge how much to bake it but I guess it needs to be dry enough to crisp up. I'll have to try this, as I usually stay away from flavored granolas. but its nice to try other variations, I don't think i've ever had hemp in a muesli. Adult cocoa pops - love it :) And permissible chocolate for breakfast - love that too! Well I have never made muesli and it is a dang shame! Love your chocolate version...what could be better than having chocolate for breakfast?! Thanks Joanne - we have always had toasted and raw muesli - your comment made me check on the difference between muesli and granola - seems muesli is unbaked and granola is baked - I assume this is an American distinction that has been creeping into Australian lingo - I did see that a large corporation tried to patent the term 'granola' but it was thrown out of court. 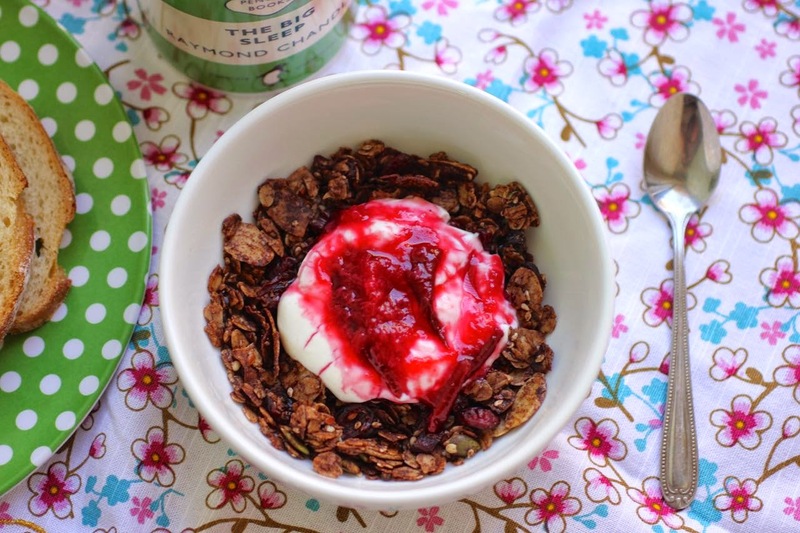 I haven't made muesli yet.... but this looks lush! I love the first picture.... definitely one to try and get through the FG editors! Thanks Kate - you were right - I didn't like the picture much but your comment made it give it a try with FoodGawker and they liked it - amazing! Good job! Well done! They are a law unto themselves. Pics that I think are ok they reject and vice versa. But I am beginning to suss what they like and that pic of yours is definitely a winner!! Thanks Lorraine - I suspect it is all those fruit and nuts leftover and a desire to not make any more fruit cake or fruit mince!!!!! 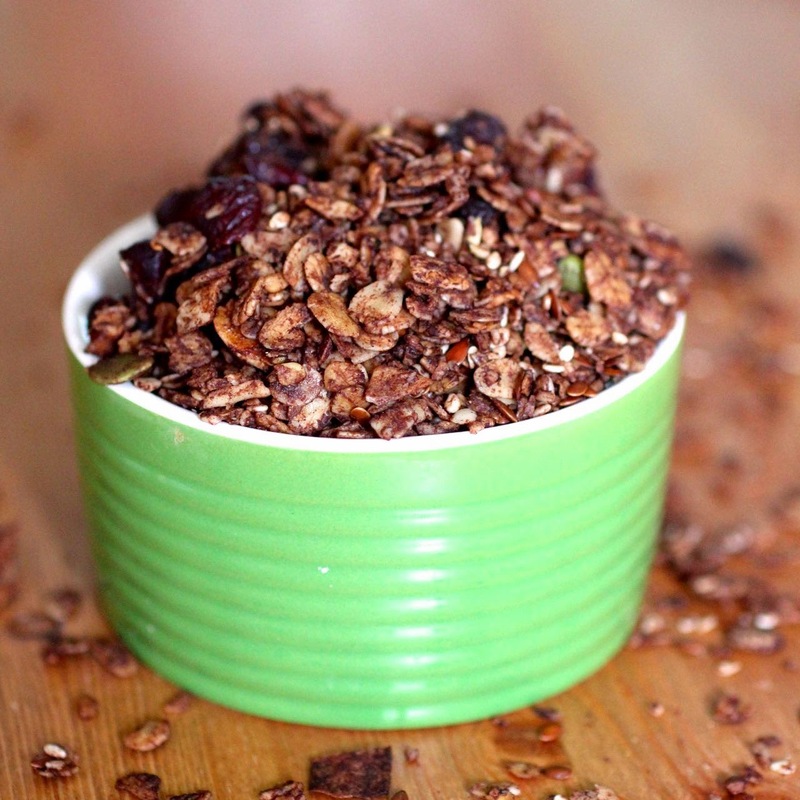 Chocolate muesli sounds delicious and I like both ways that you served it. Wow - you had me at chocolate haha. I have no problem eating chocolate at brekfast! 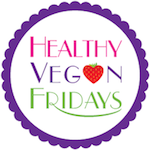 Can't wait to try this out =) Thanks for sharing at Healthy Vegan Fridays. I have pinned your recipe to the Pinterest Board. 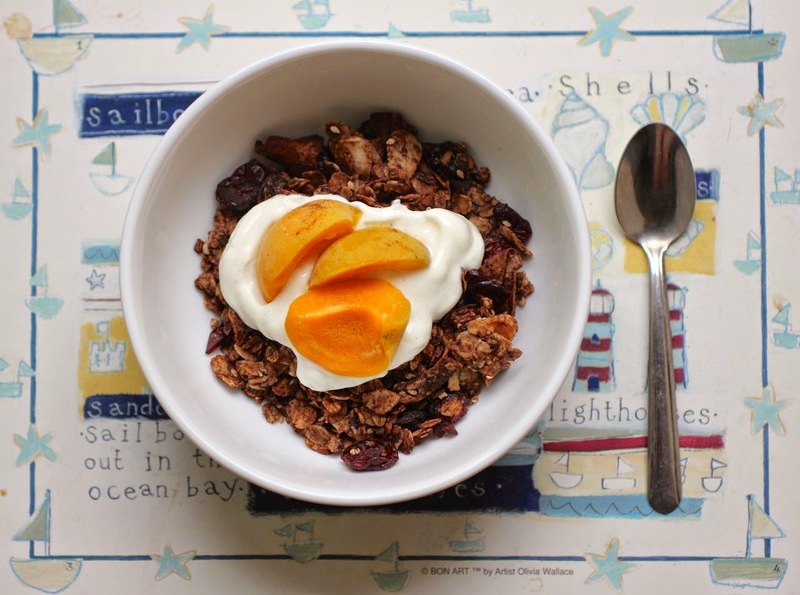 Your chocolate muesli looks fantastic, I love eating it with coconut yoghurt and fresh fruits.